Remember the difference between nice to have and need to have. Annemarie Galeucia runs operations for TEDxLSU. As an educator, she focuses on communications coaching and loves giving students the experience of running a TEDx. Her experience in high-stakes communications helps her mentor and prepare students for real jobs. 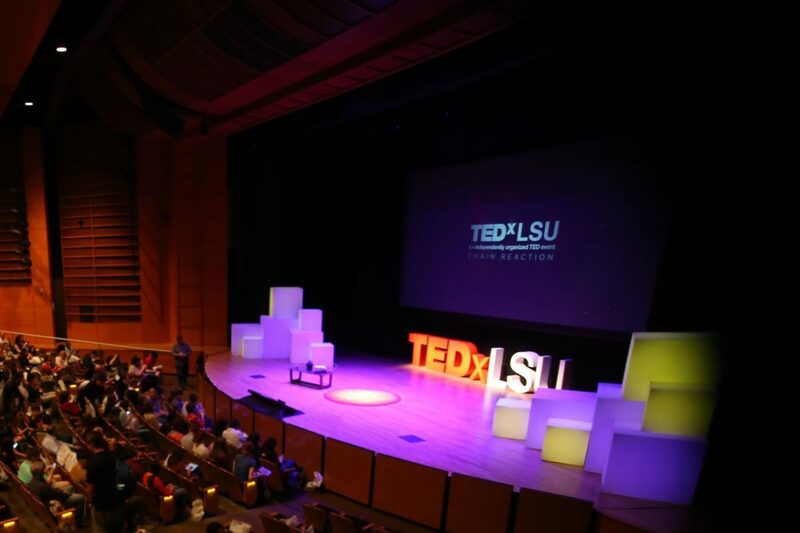 TEDxLSU celebrates the ideas from Southern Louisiana, and she coaches students and speakers to translate these local ideas for a global audience. Their event in the LSU Union Theater officially holds around 1200, but they’re slowly amping up. The 2017 event saw more than 800 people, which was a 200-person increase from the year before. She mentions that the people of Louisiana love to throw parties and TEDx is a great excuse to throw a big one. To improve communications, she strongly recommends that teams use SLACK to stay connected. She’s a big fan of the TEDx Hub and has found many resources there that she shares with the larger team. Podcast recorded: March 11, 2017. She’s an educator for LSU CxC, Co-Organizer for TEDxLSU, a researcher in Material & Public Cultures and uses a lot of that experience to help in working on TEDx. She’s been involved in TEDx since 2014. They do Salons in addition to the main annual event. She says she’s tempted to do a Youth and Women events, but school schedules are incredibly tight. The Louisiana Flavor (I should have asked her about food when she said this.) Hospitality is a big part of their culture, and she feels like TEDx is an excuse to have people feel like they’ve been invited over to the house for a party. Collaborating. Annemarie is great at connecting the dots. The epic battle against the clock. She says this is a challenge and a payoff, especially working with passionate speakers, helping them craft the message in a new way. If you are a faculty or administrator working with student volunteers, let go of control. Instead, use this as a lesson in ownership and accountability. Having a clean slate and re-engaging the community. Last year was a tough one for Baton Rouge, including the widely publicized shootings and flooding. The opportunity now is to make something good happen and get the community inspired. She was at TEDFest and met a lot of organizers and now wants to go to TEDxJAcksonville and TEDxBeaconStreet and TEDxBerkshires. First, on logistics, having excellent communications between the team is vital. Use Slack. A lot. Second, remember the difference between nice to have and have to have. Keep focused.